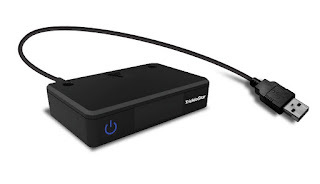 The TrickleStar USB Motion Sensor is the perfect energy saver for desktop users. Plug the USB into your computer and configure your timer. The timer can be set for 10, 15, 20, 25, or 30 minutes. So, if you walk away from your computer and haven't used in your slotted time, the TrickleStar will automatically put your computer to sleep. It's compatible with Mac and PC computers. A red and blue flashing light will let you know when it's about to send a sleep command to your computer. If you want to stop the command just hit the move your mouse. You can hit the quick activation button if you already know you'll be away from your computer for some time. The TrickleStar USB Motion Sensor will save you on energy by putting your computer to sleep when not in use.